image from page 5 of Sales Clipper, Vol. 18, No. 2, Feb. 1960 accompanying article entitled "Jet Geography, Pan Am Style, Shrinks the World". Caption reads: "Smaller and Smaller - These globes, drawn in proportion, demonstrate how new generations of aircraft are shrinking the world." 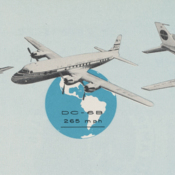 Pan American World Airways, Inc. , “Artistic sketch of various model aircraft demonstrating the increasing speed one can travel the world,” UM Libraries Digital Exhibits, accessed April 22, 2019, http://scholar.library.miami.edu/digital/items/show/1799.